Stealth and timing are essential to the Ninja way. If you are not quiet enough or you miss your window, you may lose your target. Ensure that does not happen with the Tornado Shuriken Leather Holder and stop fumbling for your blade! Designed to carry LARP shurikens such as the LARP Tornado Shuriken (MCI-3161), this handmade leather throwing star holder eliminates the hassle of trying to pull a shuriken from a pouch during LARP combat. 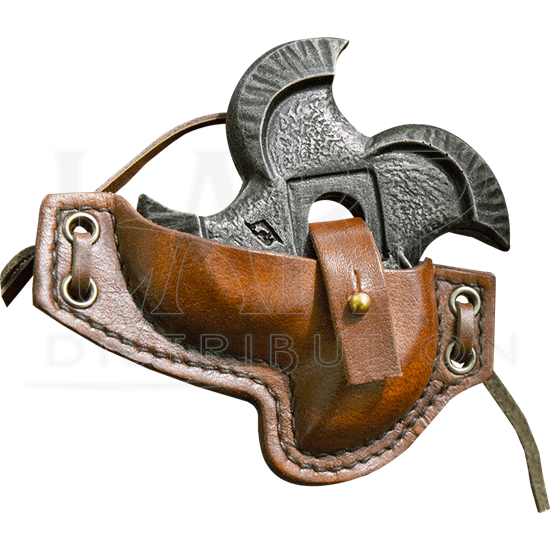 Available in both black and brown, this incredible leather LARP accessory ties to your belt with leather laces and keeps your ninja stars secure with a strap and button fastener that goes through the center hole of the shuriken. Keep your ninja throwing weapon close to your side and readily available with this epic holder!